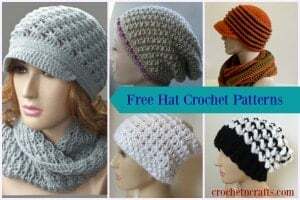 FREE Crochet Pattern for a Super Cozy Winter Hat. This hat is super cozy due to the layer of surface crochet. And then I made mine extra long so I could fold the ribbed edge up for an even thicker layer around the ears and forehead. The little dude in the picture is looking a wee bit sad as he was rather warm during the photo shoot. But he won’t be sad when the cold weather hits because he’ll be nice and cozy then! As with most of my hat patterns, this hat can be increased or decreased to any size that you need in a simple multiple of two. Simply crochet your ribbed edge to a comfy fit around the head to fit any baby or adult. 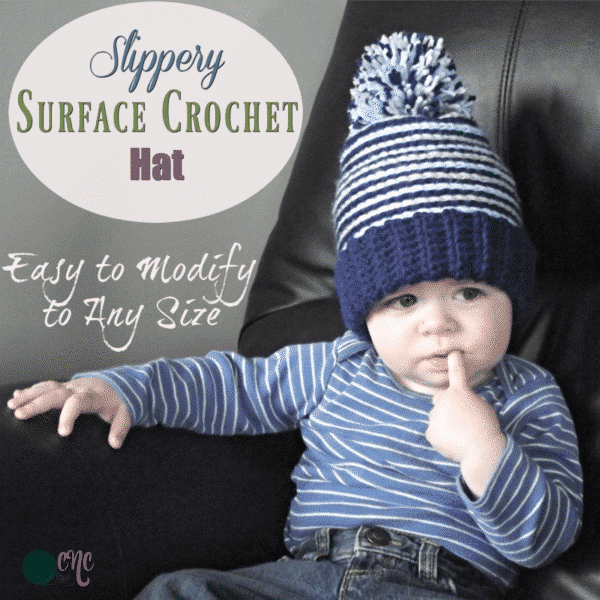 Just remember to keep your surface crochet stitches loose in order to keep the hat stretchy for a comfy fit. And, it’s perfect for both genders… just choose your colors accordingly. Gauge: Ribbing Rows: 1″ = 4 sts and 4″ = 14 ribbing rows. Hat Body: 4″ = 14 sts after surface crochet. Finished Size: Laying flat it measures just under 8″ across and 10″ long. Fits a 6-12 month old baby, however, it can be crocheted to any size as desired. I made mine extra long so the brim can be rolled up for a double layer around the ears. When working the surface crochet stitches, make sure to keep them loose to allow for the hat to remain stretchy. You may need to go up another hook size. Refer to this tutorial by Moogly on how to do the Surface Crochet. The surface crochet rounds are not counted as individual rounds, but rather as part of the previous single crochet round. Thus, you would work one round of single crochets and one round of surface crochets in order to complete one round. To make the invisible join, fasten off after last surface crochet has been made. Thread tail end of yarn onto yarn needle and weave it under both loops of first surface crochet in the round. Bring your needle back and insert in the middle of last surface crochet keeping your tension the same as the surface crochets. Weave tail end in on wrong side to secure. Refer to this tutorial on the Invisible Join. To make the pom pom, use a pom pom maker or the palm of your hand. Here is a short tutorial on how to make a pom pom. Rows 2-54: Ch 1, blsc in each sc across. Turn. (9 sts) Continue with this row until you have reached a desired circumference making sure to end in an even number of rows. Rnd 2: With CA, Ch 1, blsc in same st as join and into each st around; join with sl st in first blsc. [54 sts] Do Not FO, but drop the loop from hk. With CB and K hk, work 1 surface crochet in between each sc made in Rnd 2. Work another surface crochet into the joining sl st of Rnd 2. FO and join the rnd with an invisible join. You should have the appearance of 56 chs (surface crochets). Rnd 3: Pick up the dropped loop from Rnd 2 and rep Rnd 2 with CA. With CC and K hook, work 1 surface crochet in between each sc made in Rnd 3. Work another surface crochet into the joining sl st of Rnd 3. FO and join the rnd with an invisible join. You should have the appearance of 56 chs (surface crochets). Rnds 4-15: Rep Rnds 2 and 3 working a round of surface crochet in between the sts of each Rnd. Surface crochet with CA as established above. Surface crochet with CC as established above. Fasten Off CA leaving a 10″ tail for closing the circle. Weave the tail end through last Rnd and pull tight. Weave in to secure. Make a Pompom using all three colors and attach it at the top. You might also enjoy a browse through the crochet hat collection at CPB.